1. To create dynamic visual impact with little long-term commitment, try layering flowers and low-growing greenery in your front yard. These plants are arranged in the ground in a curving pattern, rather than just straight across the lawn. 2. Add drama by layering the height of your plants. Big in the back, small in the front. 3. Have a section of your front yard that's too awkward to mow? Fill it with rocks. Problem solved. 4. Take the DIY landscaping ideas off the ground and to the house by installing a few window boxes (they're surprisingly easy to build). 5. Or try an outdoor shelf instead. 6. If you have a large front yard with little dynamism, add large boulders and rocks for variety. 7. How about creating a berm? What's a berm, you ask? It's when you transform your totally flat yard by creating mounds of interest. Easy, and totally affordable. Be sure to do your research first before create a berm around the base of any tree, as too much dirt can suffocate the tree. 8. No trees on your lawn? Build a trellis or two for your front yard flowers to climb (they are also fairly inexpensive to purchase). 9. 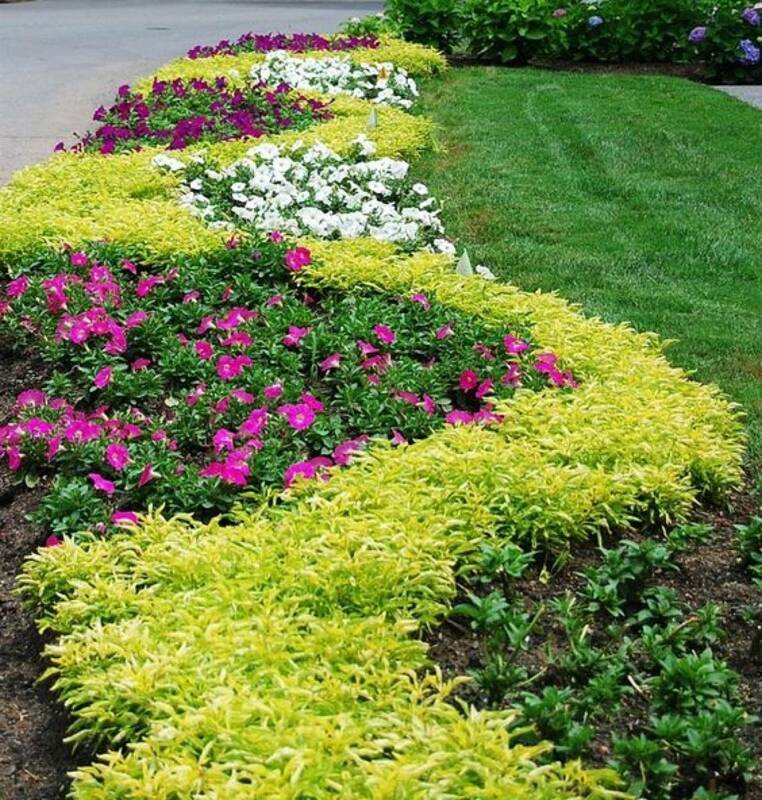 Looking for inexpensive ways to create borders or edging? 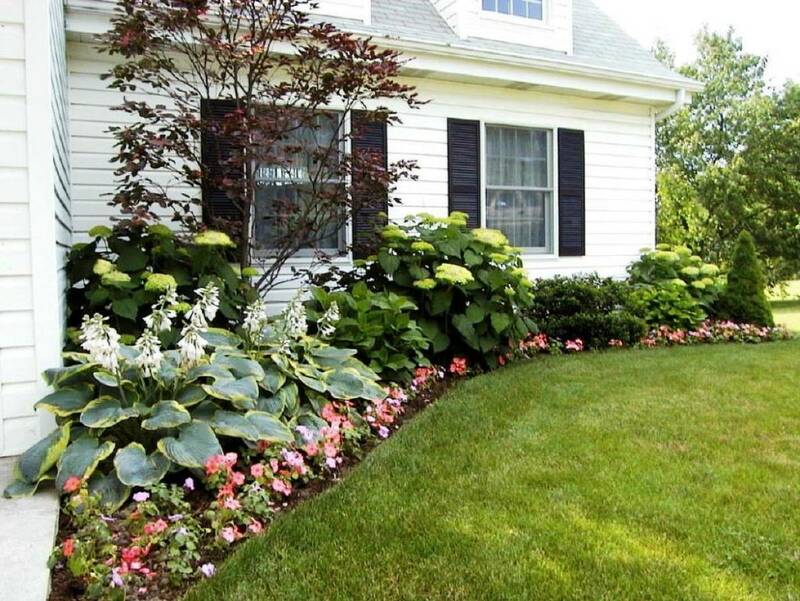 Border your walkway with plants and flowers to define lines in the front yard. 10. DIY landscaping ideas don't get much more affordable than this: install brick edging to outline areas of your yard using salvaged or recycled brick. 11. Go for a more natural look by using stone to edge your plants. 12. Or, edge flower beds with river rock. How easy is that? 13. 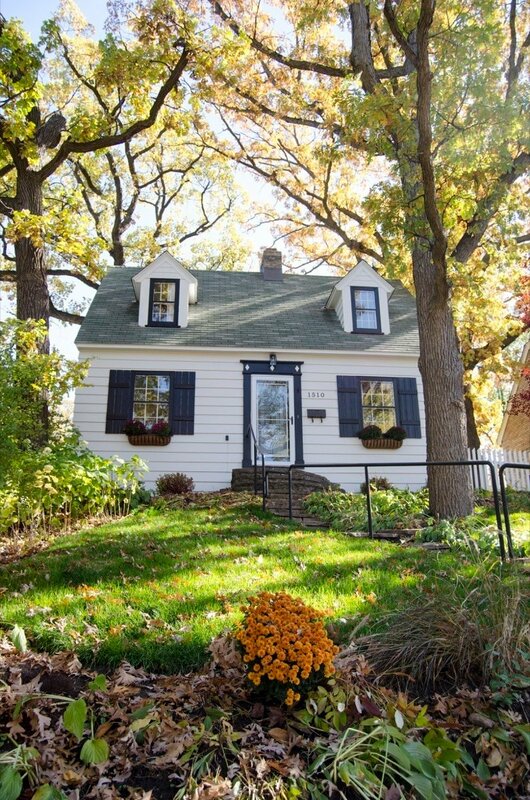 If you want to keep your yard tame but still want contrast, consider a ground cover plant. Add a few of these low-growing ground cover plants to add variation and color. 14. Display flowers in containers along steps, walkways, or on ledges. This is a great way to add visual interest if you have a lot of brick or asphalt in your front yard. 15. You don't need a professional - learn how to add a pretty stone walkway that leads right to your front door. 16. Use rope lighting to create illuminated borders to your front yard for a bright footpath at night. 17. Have a steep front yard? 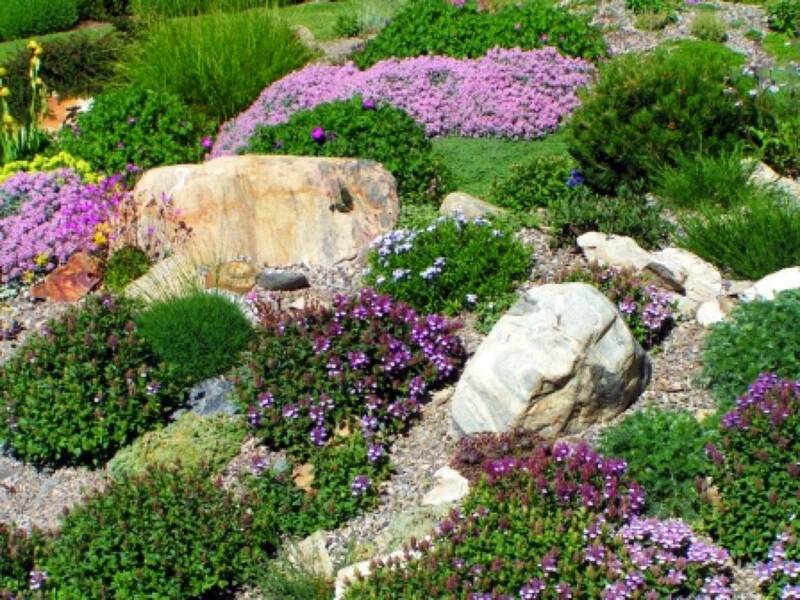 Try creating cliffs with stone and native flowers to eliminate the need to mow. 18. Ugly or boring fences no more! Create layers of plants and bushes to frame out the edges of your backyard. 19. Grow marigolds in your back yard to deter mosquitos and aphids (you can also grow chrysanthemums, lavender, and basil). 20. Create a raised garden bed to grow your own veggies (or buy an inexpensive one). It will add visual appeal, and you'll be able to reap the benefits of your labor. 21. Give your back yard some interest by building your own paver patio. 22. Or go for a full-blown pergola! A bigger back yard project, but much more affordable if you do it yourself. 23. Hang some outdoor bistro lights on these easy-to-build light stands to illuminate your yard. 24. Get ready for DIY landscaping ideas straight out of childhood. Why not create a secret garden in your back yard? The 9-year-old in me is absolutely giddy over this idea. 25. Create a flower-filled fence line. 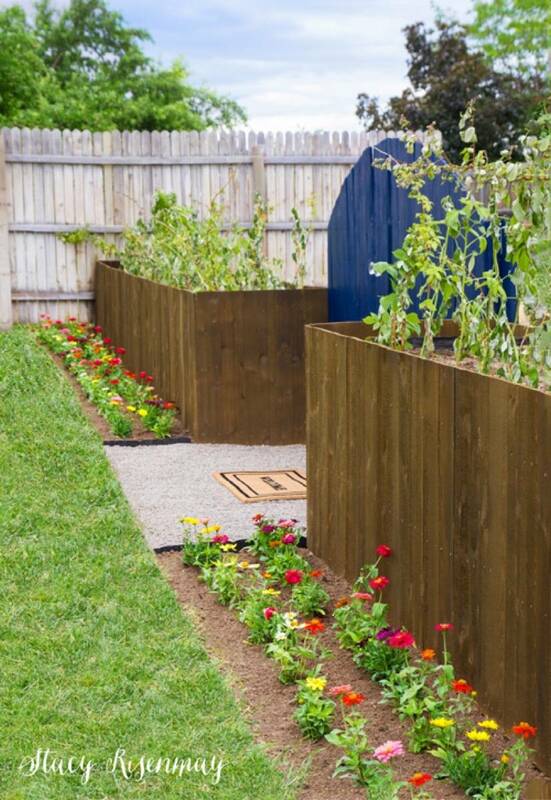 Here are some plans a fence with built-in flower planters. 26. First time fire pit builder? Here's how to make this one in four easy steps. 27. 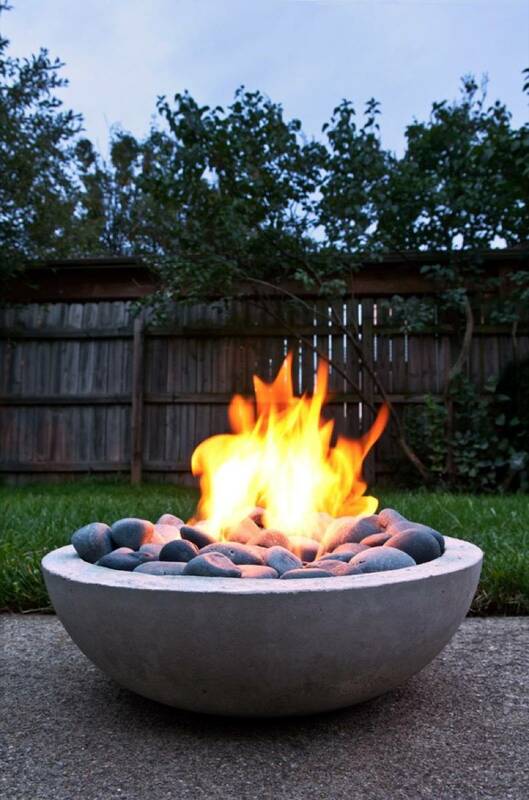 Follow this tutorial for a more modern fire pit. 28. If you have an old washing machine lying around, you can create this one-of-a-kind upcycled fire pit. 29. Would you have guessed that this fire pit was initially made out of cinder blocks? Learn how to skim-coat to create this clean look. 30. If you're handy with a welding torch, you can make a minimal fire place from metal. 31. Maybe you don't want a whole fire pit, but a little glow would be a nice touch to your back yard. Here's how to create a mini glass fire feature. 32. No back yard to build a fire pit? No problem. You can still toast marshmallows in a terra cotta pot. 33. Water features don't have to be complicated, or even powered. They can be as simple as a bird bath. Build your own, or purchase an inexpensive one. Give your yard something of interest, and beautiful song birds, too. 34. 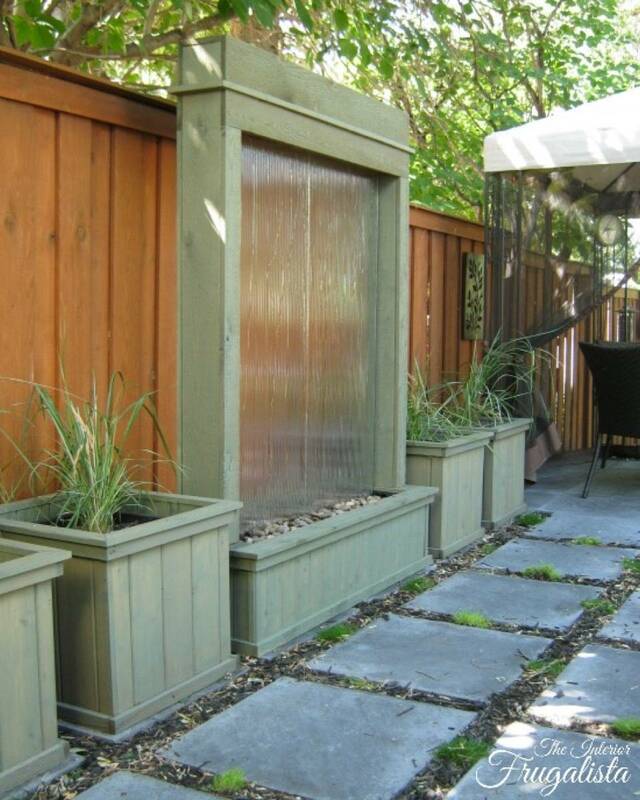 Create visual appeal in your yard by building your own urn water feature from a ceramic vase. 35. Stack 'em up! With a little extra effort, you can transform the previous project on this DIY landscaping ideas list into a multi-level water feature. 36. You don't need special skills to build a water feature, just a bit of time and the right tools. Here's how to build one from stone. 37. This is one of those DIY landscaping ideas that is going to require the help of a friend, but if you're into drama, consider building a stone pond fountain. 38. Don't you love this low-to-the-ground look of this stone fountain? 39. Big impact at a little cost! Check out this tutorial for making a waterfall wall for under $300. 40. For the ultimate "wow factor," accent your outdoor space with an outdoor waterfall. 41. Add privacy by planting some shrubbery yourself. It's as easy as digging a trench, dropping the plants in, teasing out the roots, and watering. 42. Nothing beats the backyard privacy of your own fence. Before you begin the building process, you'll need to be sure of a few things: Verify your property line, check with your city or township about the limitations and height-restrictions of your fence, have someone from the city come and check for gas lines, and have a neighborly chat with anyone you'll be sharing the fence line with. 43. Need just a bit of privacy? Build this floating garden wall. It comes complete with shelving for plants. 44. For natural privacy, build a trellis wall out of copper pipe to create a green barrier over time. 45. Create a visual divide and build a mod trellis. 46. Transform your privacy wall using shou sugi - the process of burning wood, making it water-resistant. Side effect, the shou sugi treatment transforms wood to a beautiful, rich black color. 47. Create an implied wall to divide your yard using small trees or shrubs. 48. Need lots and lots of privacy? There are cheap trees you can buy that over time will block out the neighbors, like the inexpensive Leyland Cypress. 49. No shade? Create an outdoor hangout space by getting an affordable fabric gazebo. 50. Or sew curtains to hang from your pergola to block a little light when needed. 51. Add a sun sail for immediate shade (bonus if you hang it over your own trampoline lounge!). 52. Grow shade by planting rhododendron in your yard. They're a dense evergreen with broad leaves, and the flowering in the springtime is lovely. 53. Grow Chinese Wisteria on an existing structure or trellis to block light (be mindful - this plant is known as an invasive plant in some areas). 54. Add mulch to cover the most shaded parts of your lawn. 55. Another genius (and affordable) of the DIY landscaping ideas: Add ground cover plants to hide gnarly roots. 56. Or, opt to grow some moss instead. 57. Use stone to edge the area around the base of your trees. 58. Or build a raised flower bed at the base of the tree (be careful not to add too much dirt around the base of the tree, as you could hurt or kill it). 59. For extra seating, create a one-of-a-kind tree bench. 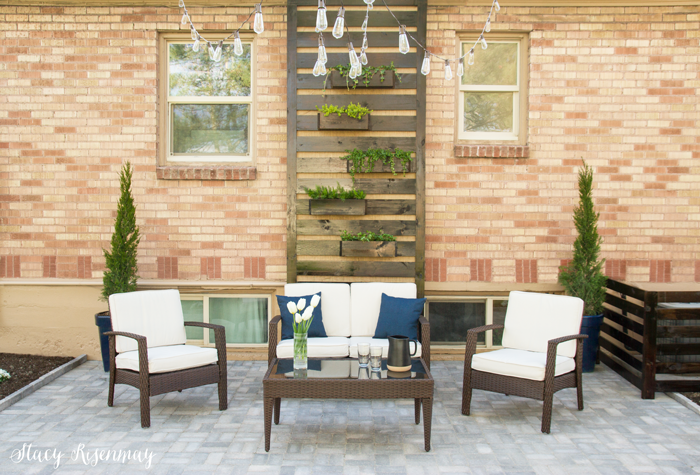 Want more DIY landscaping ideas? Here are 13 more tips for landscaping on a budget.